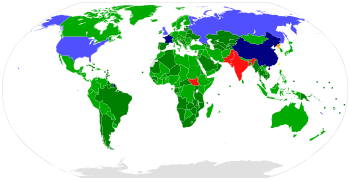 ↑ 1.0 1.1 "UNODA - Non-Proliferation of Nuclear Weapons (NPT)". un.org. สืบค้นเมื่อ 2016-02-20. ↑ "Nuclear Non-Proliferation Treaty (NPT)" (PDF). Defense Treaty Inspection Readiness Program - United States Department of Defense. Defense Treaty Inspection Readiness Program. สืบค้นเมื่อ 19 June 2013. ↑ Ambassador Sudjadnan Parnohadiningrat, 26 April 2004, United Nations, New York, Third Session of the Preparatory Committee for the 2005 Review Conference of the Parties to the Treaty on the Non-Proliferation of Nuclear Weapons, furnished by the Permanent Mission of the Republic of Indonesia to the United Nations (indonesiamission-ny.org) Archived พฤศจิกายน 20, 2005 ที่ เวย์แบ็กแมชชีน. ↑ 4.0 4.1 Graham, Jr., Thomas (November 2004). "Avoiding the Tipping Point". Arms Control Association. หน้านี้แก้ไขล่าสุดเมื่อวันที่ 5 มีนาคม 2562 เวลา 09:32 น.